Twigs densely short soft-hairy, eglandular. Immature inflorescence axes densely hairy, eglandular. Pedicels densely hairy, eglandular. Fruits densely hairy, glabrescent, eglandular. 2n = 26. Subspecies canescens is widespread in California’s North Coast Ranges and northward into southern Oregon. Disjunct populations occur south to the Monterey, California, area. Hybrids with Arctostaphylos viscida in southern Oregon were named A. cinerea Howell. 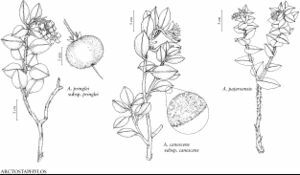 Facts about "Arctostaphylos canescens subsp. canescens"